The meeting included a 120 yards flat handicap for 15-17’s with six heats, 100 yards open handicap with 18 heats in which all sprinters of whatever standard took part with the best American and English men competing with all standards of Scottish runners and a 440 yards handicap with multiple heats. There was of course also a 5-a-side tournament which was won by Rangers from Queens Park. A year later the star attraction was Wyndham Halswell who won the 440 yards in 50.2 (headwind up the finishing straight) with Stark winning the 100 yards in 10 seconds and McGough the half-mile in 1:58.8. A very good meeting was the verdict and on the Monday, the ‘feature of the meeting’ was the running of George Butterfield in the 1000 yards. A word about Butterfield is maybe appropriate at this point. 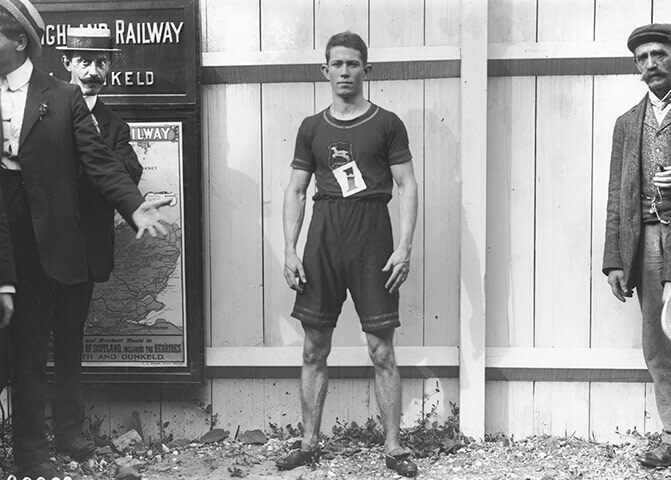 He was an Englishman (born in Stockton-On-Tees in 1879) who won the AAA’s mile title in 1905, 1906 and 1907, he also ran the world’s fastest mile in 1906 and ran in the London Olympics in 1908 in both 800m and 1500m. There was a considerable body of knowledgeable opinion that favoured him for at least a medal in the Olympic 1500 but the London organisers had decided that only heat winners would go into the final. The Americans, among others, protested about this but it stood, and the draw for heats was made in secret. 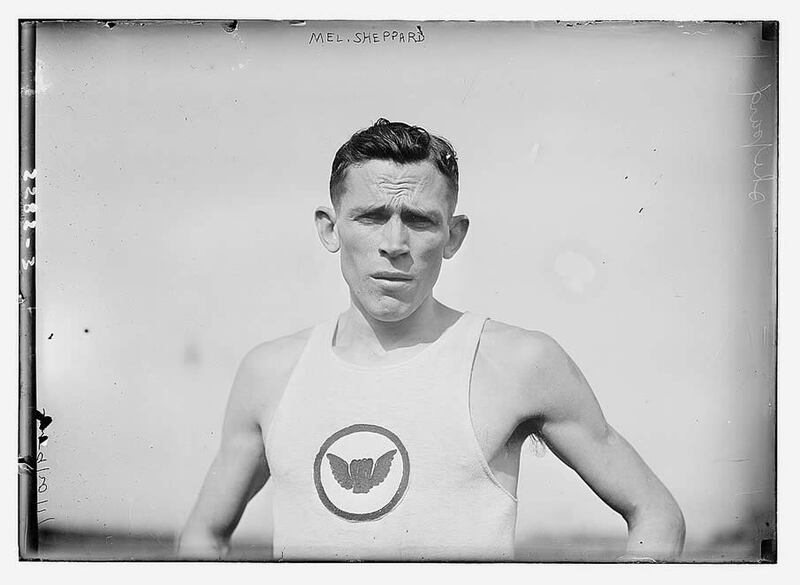 Butterfield was drawn in the same heat as America’s Mel Sheppard who won the heat in a new Olympic record time of 4:05.0. It was a bit of a travesty with several athletes mush slower than Butterfield making the final simply because they had been drawn in a slower heat. He died in the First World War serving with the Royal Garrison Artillery. Local papers were fond of the story that he once raced a greyhound – and the dog was second! 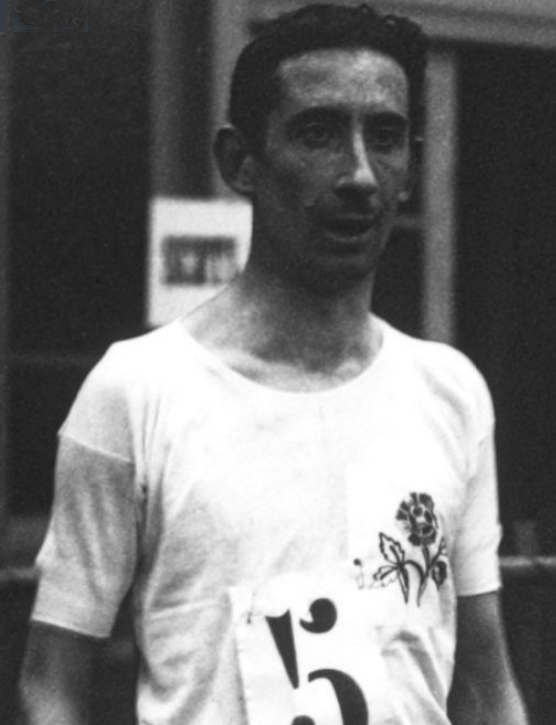 Butterfield was a favourite at Ibrox where he raced several times over the years and his London conqueror Sheppard was also highly thought of by the Ibrox crowds. The Monday meeting in 1907 was a purely domestic affair but none the worse for that. The report simply said that ‘The Rangers Football Club continued their sports last night at Ibrox Park. The weather was excellent and there was a capital attendance.’ And that was it. The results were listed showing that there was a 100 yards handicap with 12 heats, a 1000 yards handicap, a 220 yards handicap with 6 heats, a one and a half mile handicap plus the 5-a-sides in which Celtic won over Third Lanark by 2 goals to 1. There was also a 1000 yards flat handicap won by HT Jamieson (Watson’s College – 20 yards) in 2:16 from Sam Stevenson of Clydesdale Harriers (off 26 yards): McGough and Butterfield were both entered but neither started. There were twelve heats of the 100 yards, result above, nine heats of the 220 yards, a mile and a half handicap in which Sam Stevenson (55 yards) was third behind Templeman of Bellahouston (110 yards) and Young of Paisley Harriers (170 yards) and an invitation quarter mile handicap in which Halswell (off scratch) finished third in 49.8 behind Young (Bellahuston – 18 yards) and Hepburn (West of Scotland – 27 yards). The obligatory 5-a-side had the six Glasgow clubs in it (Rangers, Celtic Queens Park, Third Lanark, Clyde and Partick Thistle) and, just to show that the draw was random, Rangers met Celtic in the first round and won 3 – 1. The final was won by Clyde who beat Third Lanark by 2 goals and 1 point to 1 point. The last sports of the decade held the Monday meeting on 9th August. It was a great success although the crowd was ‘only’ 6000. Seven record set on the night and top class runners including Olympic medallists Walker and Robertson to entertain the crowd. Robertson actually finished third in the race running from scratch behind club mate William Scott of Broughton Harriers (75 yards) and Tom Jack from Edinburgh off 80 yards. There was a local runner from a club that I had never heard of called ‘Glasgow Hairdressers AC’ competing in the 100 yards and although he won his heat of the 100 yards, was unplaced in the semi final. Still, a very good meeting to end a decade of top class athletics.